The founder of Bessey’s Positive Paws, Erin Bessey, has been passionate about dogs from a very early age. While attending the University of Maine at Orono for her Bachelor of Science in Zoology, her passion for dogs evolved into an appreciation for education and understanding. Erin graduated from the University of Maine in Orono with a B.S. in Zoology in 2007. While in college Erin became employed at Green Acres Kennel Shop in Bangor where her professional career in dog training truly began. She worked in the kennel as a Certified Pet Care Technician and started as an assistant dog trainer but soon became a lead instructor. During this time she also volunteered for Guiding Eyes for the Blind, a non-profit organization based in New York State. She raised 3 dogs for Guiding Eyes who in turn were able to provide them to someone in need. In addition, she volunteered for a 6 week internship in New York where she worked daily to evaluate the temperaments and trainability of the Guiding Eyes puppies. In 2007, Erin graduated from college and moved to Whitefield accepting a position with the Windsor Veterinary Clinic thus ending her time in Bangor. Erin worked full time at the veterinary clinic. This has afforded her the opportunity to become more educated with respect to the husbandry of dogs and the identification of red flags for illness/injury. In 2010, Erin resumed her position, part-time, at Green Acres Kennel Shop as lead training instructor. In 2011, she earned her Certified Professional Dog Trainer – Knowledge Assessed certificate through the Certification Council for Professional Dog Trainers and joined over 2000 certificants worldwide. The CCPDT was created by the Association of Professional Dog Trainers, which Erin is a professional member of. She is also an APDT C.L.A.S.S. instructor. Erin shares her home with her supportive husband, 2 daughters, and three labs, Scout, Henry and Tripp. Henry was rescued by Erin at 2 days old when he came to the veterinary clinic as a puppy with a cleft palate. Henry required around the clock bottle feedings for the first 8 weeks of his life. At one year of age Henry required knee surgery (torn cruciate ligament) which required strict physical therapy for 6-8 weeks. Henry later required a second surgery for his other knee. Erin then acquired another rescue pup at 1 day old, Tripp. 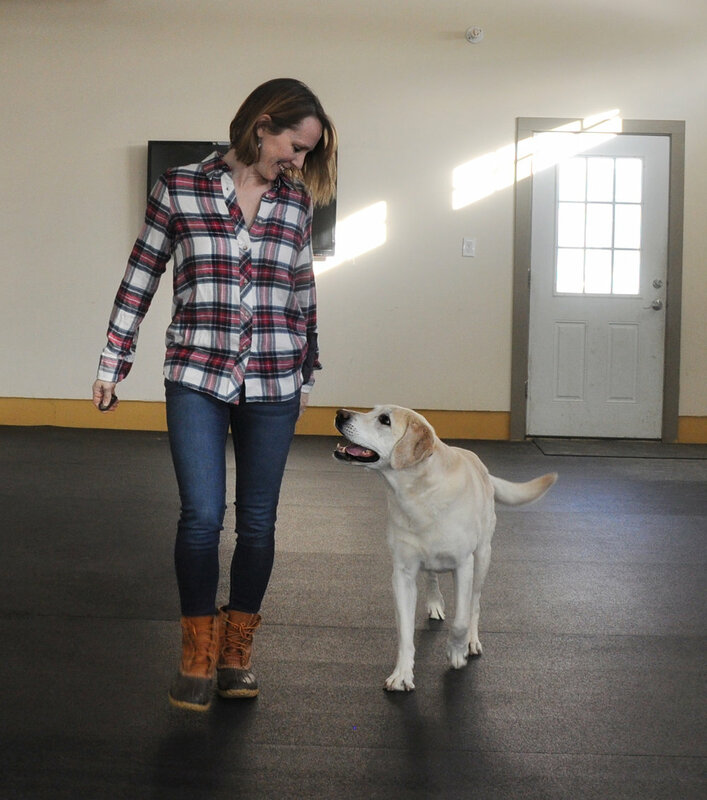 Dogs are a part of Erin’s everyday life whether it is rehabilitating or training her own dogs, working with clients or working at the Veterinary office. She can often be found attending seminars and classes to continue educating herself in everything dogs. Mission: Bessey’s Positive Paws promotes “family friendly” training methods that children and adults of all ages can use. BPP strives to combine contemporary knowledge with scientifically proven training techniques to create a safe, positive environment in which owner’s and dogs can learn to live harmoniously together. BPP uses a combination of classical conditioning and operant conditioning (clicker training) to train behaviors. Clicker training utilizes a marker and a reward. A marker, such as a clicker, whistle, or word, indicates to the dog the precise moment they did the desired behavior. A reward can be food, play, petting or verbal praise. Food is often the most valued reward but in some instances play is more motivating. Clicker training is used in aquariums and zoos worldwide. It is proven to be faster & more effective than the “traditional” training techniques. Positive reinforcement training employs humane, effective, respectful training based on scientific studies. Dogs do what works for them. Training by rewarding the desirable behaviors will make it so that they are more likely to happen in the future while trying to prevent reinforcement for the less desirable behaviors. When we use positive reinforcement we are teaching our dogs to make the right choices because they want to, not because we have forced them. Every interaction with your dog is a training opportunity. At Bessey’s Positive Paws we help you understand learning theory, why our dogs do what they do, & canine communication and give you the tools needed to implement a reward based system with your dog.